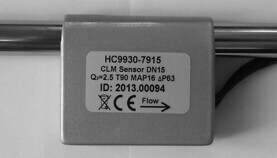 CLM consists of an electronic device (calculator and communication) and a sensor glued to an iron, copper or plastic pipe. There is no cutting of pipes necessary hence no risk for water leakage. CLM is glued to 12 to 108 mm pipes. No cutting of pipes and no need to closing the flow of water. CLM is installed by the same technician who installs the communication network. 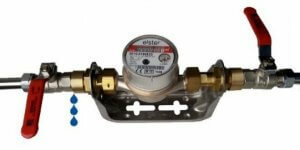 To install a traditional meter one have to cut the pipe, install valves and a wall mounting gear. The cost for the additional parts frequently exceeds the cost of the meter itself. Installation shown in the picture above contains 8 potential leakage points. Installation is made by a plumber. Once that is done a network technician connects the meter to the building’s communication network.